I finished another thing! 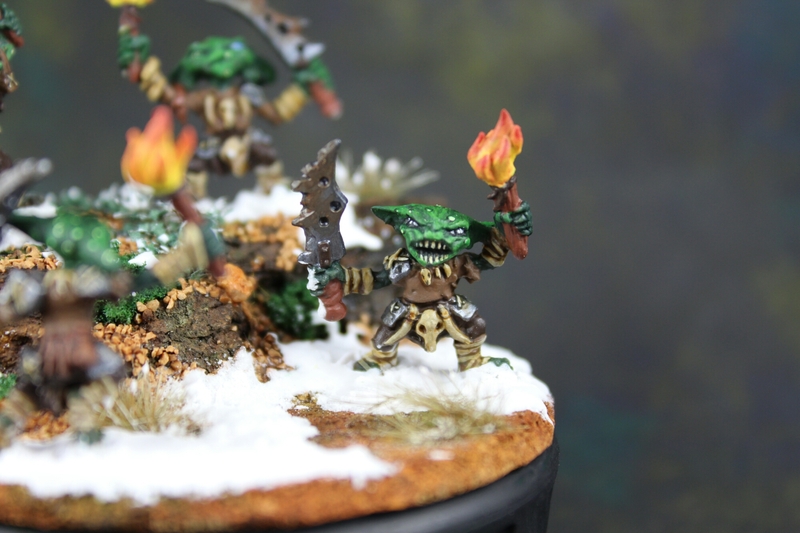 These guys were soo much fun to paint! My partner sent me the theme, “it’s doesn’t always have to be barbarians in the snow.” So, I figured barbarians need something to fight in the snow! Also, they fight each other. I had to flip the one guy because whiskey fire was blowing a different direction than anyone else’s…. But I got to play with my camera’s manual focus settings to get everything focused, that was an experience! I didnt realize when I started painting minis that I would have to learn several other skills as well. Hehe. 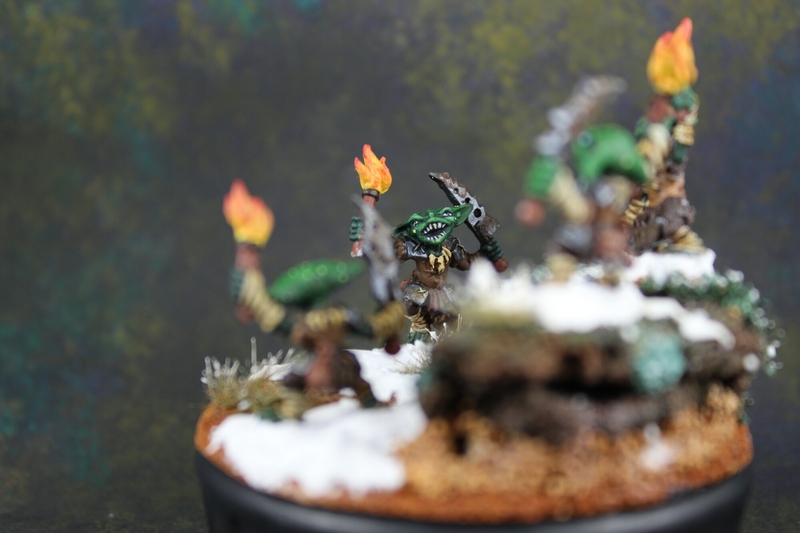 Painting, basing, and photography aren’t bad things though! Anyways, hope y’all like them, and I’m sure hoping my partner does too! Let me know what you think! Great job on the little diorama. I love the spotted goblin look. 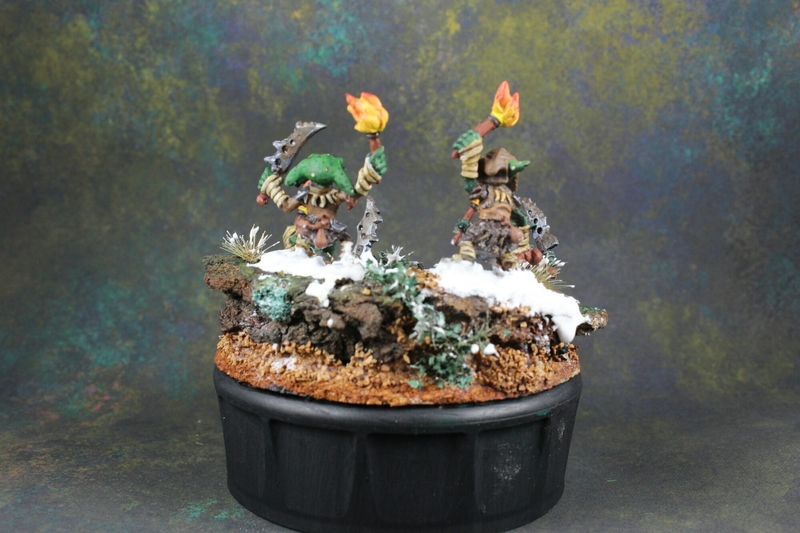 I’ve only finished one and a half of my goblin pyros, and need to get back to work on them. 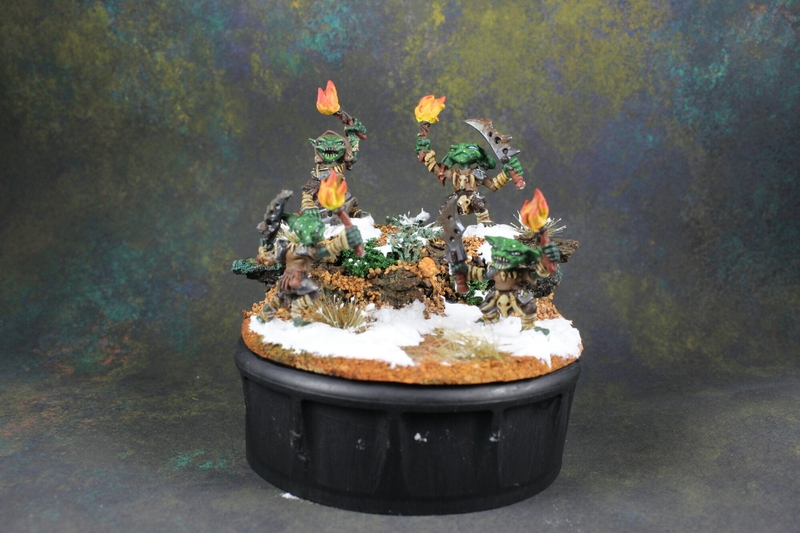 The base is great, but I recommend painting the rocks and gravel. The natural material is a bit jarring to the eye when put next to the painted minis (tip from Alison Bailey’s and Michael Proctor’s basing classes). Thanks! Basing is definitely something I have to work on. On this One I tried using washes and inks to kind of punch up the natural look. Guess I missed the mark. I’ll have to do more dioramas then! Proctor even recommended drybrushing static grass in his class so it would have a bit of paint on it. It’s never looked quite right when I’ve tried it myself. Maybe I need to practice a lighter touch. Hmm. Interesting thought. I mean, I guess that’s what I did with the snow on the static grass.. It definitely needed a light touch!